Pakistan wins the 1st ODI match. MS Dhoni declared Man of the Match for his fighting century. India vs Pakistan ODI series live streaming on Star Cricket and ESPN continues to enthrall us as we can easily ascertain another thriling ODI encounters between these two big teams. It is really hard to predict the winner of India vs Pakistan matches but it is easy to predict that each and every match will turn out to be a pure cliff hanger. After a last over finish in the first T20, India was under pressure and 0-1 down in the T20 series. They bounced back hard to score 192 in second T20. Pakistan didn't let the match go easily as they also managed 180 odd runs. A marginal loss to Pakistan resulted in another tight finish. Can we expect similar kind of outcomes in the India vs Pakistan ODI series? Well the answer is pretty simple - ofcourse Yes! This three ODI is going to enthrall us with some quality cricket and another tight finishes. Only factor that we would miss a lot would be Sachin Tendulkar's presence. His retirement from ODI cricket was a disappointing thing for fans who bought tickets with an expectation to see him playing against Pakistan. India vs Pakistan 1st ODI is scheduled to be played at MA Chidambaran Stadium, Chepauk in Chennai. This stadium has a capacity of 50,000 spectators, almost equal to the attendance we say in the second T20 match played at Ahmedabad. This stadium has floodlights since it hosted World Cup matches in 1996. As per the weather department, we may expect some scattered thunderstorms and the temperature would range from a maximum of 29 degree Celcius to 23 degree Celcius. So not a very warm day for the players. Some comfort as far as the temperature is concerned and hopefully we don't have any stoppage in the play due to Weather God. Pakistan has a slight modification in their ODI squad and the replacement players have joined Pakistani camp after the first T20 match. Meanwhile India has made certain changes for the ODI squad as well. Zaheer is excluded from consideration as selectors feel he should concentrate more on test cricket. Sehwag who is completely out of form in ODI cricket needs to prove his worth as fortunately he is selected one more time for this ODI series. Apart from Bhuvaneshwar Kumar another new face added to the squad is Shami Ahmed who is a seamer from Bengal. Amit Mishra is selected over Piyush Chawla. Thus India posts a strong squad against Pakistan at home. 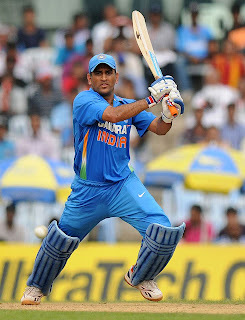 India is soon going to face England in ODI series followed by Australia in a test series at home. Some inspirational wins from now onwards would help India rebuild their confidence and perform better in forthcoming cricket series.